Need a place to put your keys? Hang your necklaces? 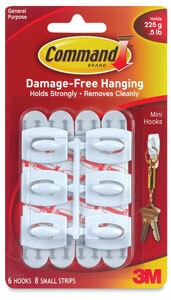 3M Mini Hooks let you do those things and more without permanent surface damage. Ideal for organizing and decorating any home or office, these hooks hold on strong thanks to Command adhesive but come off with the simplest pull of a tab. Thanks to the reusable hooks and clips, you can change your mind about where you want something to hang. Each package contains six mini white hooks and eight adhesive strips.